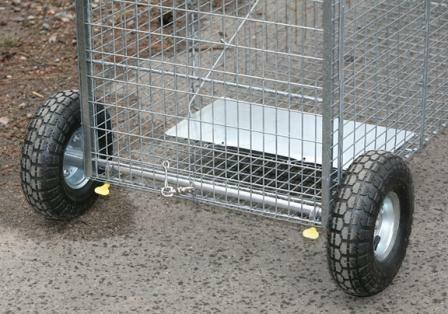 Wheel Kits are perfect for transporting large traps, especially those containing animals. Each kit contains two wheels with 10" Pneumatic tires that can hold up to 600 lbs. Double roller bearings on each side of the wheels provide long durability, and easy maneuverability. A light weight aircraft aluminum axle for extra strength and durability allows for easy attachment to the bottom of the trap. The axle can stay permanently attached and the wheels can easily be removed when the trap is deployed.